Donegal House is set amongst lovely gardens in a beautiful rural area under Mt Fyffe - Kaikoura's famous landmark. All the same, it is only a few minutes from the central town area, Whale Watch and other local attractions. 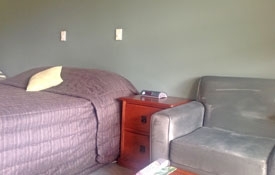 Queen bed, ensuite, TV, couch, tea and coffee making facilities, includes buffet continental breakfast. Secure parking close to room. Wonderful views. 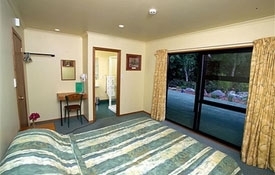 Ensuite, TV, couch, tea and coffee making facilities, includes buffet continental breakfast. Secure parking close to room. Wonderful views. Queen bed and single, ensuite, TV, couch, tea and coffee making facilities, includes buffet continental breakfast. Secure parking close to room. Wonderful views. Every night the Irish hospitality passed down through generations of Boyds is played out in the charming "Greatest Irish Hotel in the Country" - Murray Boyds' Donegal House. You don't have to be Irish to enjoy the warmth, humour and hospitality that has given Donegal House its outstanding reputation! It's one of those rare places; you will be so pleased to find it on your travels. Ireland's national drink - Guinness, and Kilkenny are both on tap and Irish and Scottish whiskeys await on the shelf. The kinship which unites the Irish who visit from all over the world is a part of the very heart and soul of the hotel, although you don't have to be Irish to enjoy the camaraderie which makes Donegal House a hit with both locals and visitors alike. Maybe you fancy trying some world-famous wines... you'll find a grand selection of wines-Allan Scott, Oyster Bay, Mudhouse and many more.